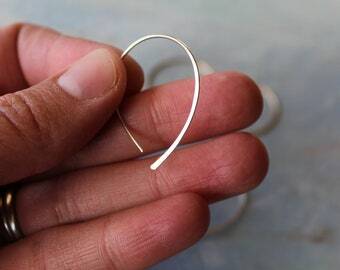 Announcement Handcrafted minimalist jewelry: silver hoop earrings, gold hoop earrings, stud earrings & threader earrings. You appreciate the little details, which is why I give special attention to subtleties of jewelry design and production. These silver and gold jewelry pieces are easy to layer or wear alone and promise to add a little sparkle everyday. Stay a while and enjoy! 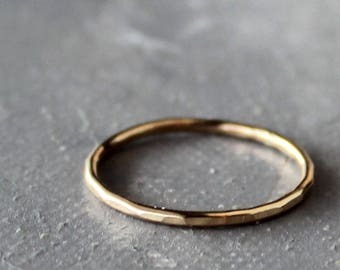 Handcrafted minimalist jewelry: silver hoop earrings, gold hoop earrings, stud earrings & threader earrings, stacking rings, minimalist necklaces, and personalized necklaces. 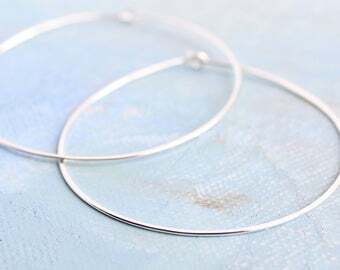 Handcrafted minimalist jewelry: silver hoop earrings, gold hoop earrings, stud earrings & threader earrings. You appreciate the little details, which is why I give special attention to subtleties of jewelry design and production. These silver and gold jewelry pieces are easy to layer or wear alone and promise to add a little sparkle everyday. Perfect size! I'm sensitive, and these don't upset my ears at all! 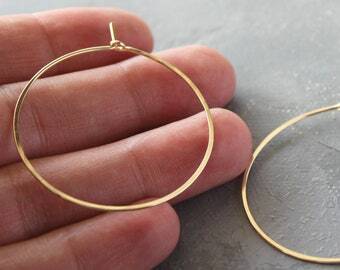 Gold hoop earrings.... Just in time! the smallest details that matter. a good place to start from. Trusty torch forming little silver stud earrings. Some of my favorite co-workers: silver wire, tweezers, ruler, file, and saw. minimalist jewelry with silver sparkle and gold glimmer. "Love these earrings! Will go with absolutely everything." "...simple but make such a statement. " "necklace is lovely! Delicate and dainty, just what I was looking for." I want you to feel the same way every time you catch a glimmer of your Sounds of Silver jewelry. 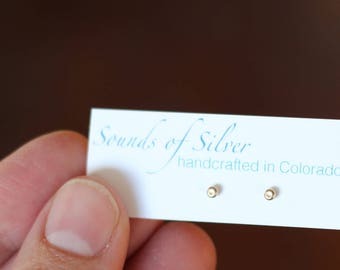 The sparkly details matter, so when making silver and gold studs, hoops, and necklaces I strive for the most beautiful shapes, colors, and textures for you while keeping it comfortable. My customers often say their Sounds of Silver jewelry becomes their everyday, go-to; a simple and beautiful reflection of self. That's my favorite kind of feedback! Sounds of Silver jewelry is easy, feminine, and subtle. I've been happily designing and creating jewelry for nearly a decade, working in sterling silver, gold fill, brass, copper, and enamel. Each piece of jewelry is lovingly handcrafted in my Colorado studio. I strive to make jewelry that's easy enough to wear everyday while still making you feel special. Jewelry-maker, color-enthusiast, mountain-watcher, sky-painter, golden retriever companion. Colorado living; Midwest raised.